Pictured in rough sawn maple with English Cottage finish. 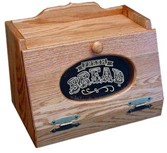 Keep bread on hand with this simple oak bread box! This Amish bread box from Amish Furniture Factory fits easily into kitchens of all styles and sizes. Go beyond just keeping your bread in its bag on your counter and make your kitchen a little bit more stylish in the process. While you're at it, take peeks at your bread through the decorative glass to make sure it hasn't gone bad! Pictured in pine with Cranberry Red paint. 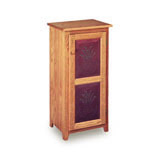 Pictured in pine in Cranberry Red finish. Pictured in pine Navy - Distressed Antique. Pictured in pine in Spicy Mustard finish with Wheat Tin inserts. Pictured in pine with Olde Navy paint body. Pictured in pine with Buttermilk with Burnt Umber back. Pictured in pine in Black finish. Pictured in pine in Burnt Orange finish with Wheat Tin inserts. Pictured in pine with a custom two tone Sage over Red finish.Custom finishes need to be ordered by phone.